There are five legislative assembly constituency in Siddharthnagar district for the 2017 Assembly elections. They are 304 Bansi, 306 Doomariyaganj, 305 Itwa, 303 Kapilvastu, 302 Shohratgarh. When Uttar Pradesh assembly election 2017 is getting ready to electios new Assembly, Siddharthnagar is not anywhere behind in the election heat. Siddharthnagar district (Hindi: सिद्धार्थनगर ज़िला) is one of the 75 districts of Uttar Pradesh state in Northern India. Naugarh town is the district headquarters. 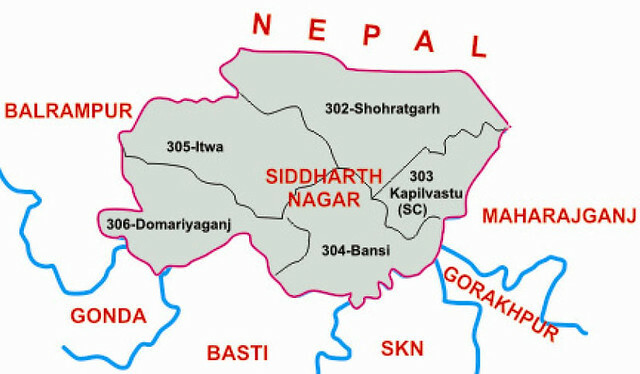 Siddharth Nagar district is a part of Basti division. According to the Government of India, Siddharthnagar district is one of the Muslim concentrated districts in India on the basis of the 2001 census data on population, socio-economic indicators and basic amenities indicators.